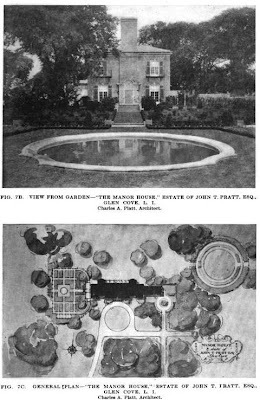 'Manor House', the John Teele Pratt estate designed by Charles A. Platt c. 1909 in Glen Cove. Following the death of J.T. Pratt's wife the house became a hotel and conference center, adding large modern wings on the rear of the house (which destroyed most of its charm). Today the house is the Glen Cove Mansion Hotel & Conference Center. Click HERE for more on 'Manor House'. 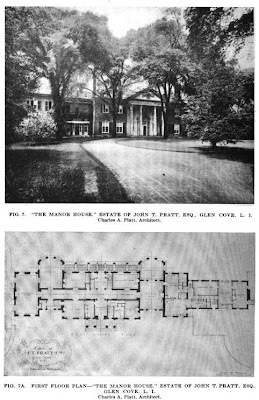 Pictures from Architectural Record, 1919. Anyone who wants to see this magnificent home as it stood shortly after Ruth Pratt's passing and just before it was converted into a hotel should try to get a copy of "A Lovely Way to Die", a 1968 detective thriller starring Kirk Douglas. Most of the film was shot in different North Shore locations (along with a few in Connecticut that included the home Leona Helmsly eventually bought). The Manor House was used in several scenes, both interior and exterior. An additional FYI regarding film, Harold Pratt's house, Welwyn, can be seen in considerable detail in the 1971 film "A New Leaf" starring Elaine May and Walter Matthau. Mrs. Harold Pratt was still living there at the time and rented the house to Paramount Pictures for the film. This home was also used in Alfred Hitchcock's North by Northwest. It's in the scene in which Cary Grant is plied with liquor and made to drive (until he is arrested by the Glen Cove police). That was actually 'Westbury House' at Old Westbury Gardens, not Manor House. You might be thinking of Sabrina. Thanks, Zach - looked similar, I guess! you're right about the additions. you'd think if they were going to piss away as much money as those cost to build they would have at least made them look slightly period. on this one the columns work because a) the place is enormous so the scale is right and b) they don't stick out too much - they're obviously part of the design. this design isn't new as they're are many of them on li but i think its an agreeable one and really says "i've got money and i'm going to wave it in your face". also too bad they scrapped most of the gardens altho that's a feature their website brags about. before and after photos of both Manor House and Welwyn are excellent depictions of the havoc wrought by Dutch Elm Disease. When closely surrounded by the magnificent elms which was clearly the architects intent, both houses look so much more grounded to their landscape and far less bulky and and awkward than they do today.